Home / Bangalore Trekking Club / BTC / Kalwarbetta / Skandagiri / Skandagiri Trek / Trek to Skandagiri / Experienced an awesome paradise on earth - Skandagiri Hill!!! Experienced an awesome paradise on earth - Skandagiri Hill!!! 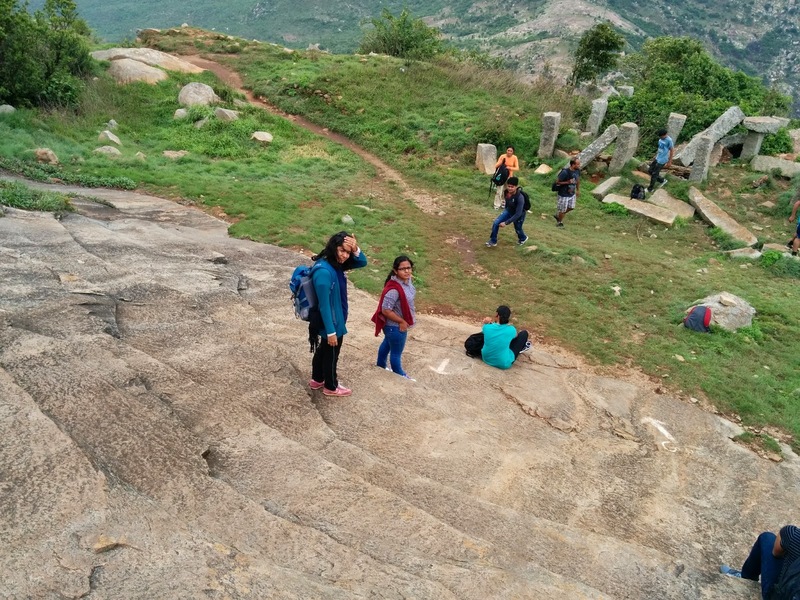 It was an early morning 6 AM, I was rushing with excitement to meet some 20 new people in my lifetime who shares one common goal “exploring the paradise – Skandagiri”….. Waiting around 7 AM, we all gathered slowly & happened to shake hands, share smiles, spread cheers, & grow warmth between each other as we travelled to CHIKBALLPUR in a local transport….. As we all reached the village by 8:30 AM.., the aroma of hot steam emitting idly, vada & dosa with colorful side orders couldn’t allow anyone to resist in indulging a mouth watering cuisine … After gearing up with a cup of hot coffee & some food parcels, we all cheerfully got into an rick & then what…..yeah, the ride started….!!!!!! Admin shared the Do’s & Don’ts, rules, & cleared all assumptions in all of us and we headed forward to reach the top notch…. It felt a little sunny ( around 10:30 AM).., when we were starting from the base all that you do is to give some constant attention towards little rocks that forms a step and we were all reaching slowly & steadily…..
Naresh & Sreemoye must be the brand ambassador for bullet racing as they carry such a huge energy & attention in reaching the hill top so fast…!!!. Hiren was constantly stopping at regular intervals, monitoring the group & made justice to his role as an admin….. There use to be always one gang I could form & it becomes Shilpa, Geetha, Nasreen, Pragathi & Aparna.., sharing jokes & trekking beside me…… after reaching few levels, we constantly gave breaks to regain energy…. Sushma on the other side was taking good care of the group in guiding ways those are really safe & easy to follow…. We all gathered on top (Around 1 Pm)… raised our hands above…. Felt the extremely chilled air that could pamper us with so much love…. That was an extremely sought tranquility I had & I bet not many on earth are so lucky enough to feel it but we all 21 happened to!!!….. Happily clicked pictures.., came down … had an extensive spread of rice/ sambar/ briyani/chocolates to fetch our hunger at an alarming rate…..We had some in-house guests too .., wondering who…..Those cute monkeys & dogs around us!!! …….. Had fun in exchanging dishes, thoughts, achievements & few more clicks to say bye to the beautiful fort on top….